Forlor is a Finnish black metal band that was previously named Depressive Void. After releasing only one demo as Depressive Void, the name was quickly switched to Forlor to fit the music and lyrical themes better. 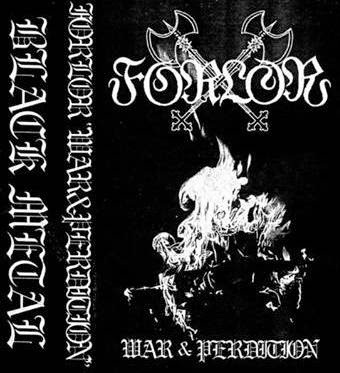 Their first demo under Forlor was recorded in 2014 entitled War & Perdition, featuring a very unique blend of influences that balances itself perfectly between the old style black metal and the newer sound the genre has acquired. The music is very reminiscent of early Bathory. The demo starts out with a very medieval and folk sounding acoustic intro. It sets the mood perfectly for the rest of the demo. Immediately after the intro is done, you are assaulted with blasting drums, killer guitar lines, and eerie shrieks that pierce through the music like needles in your ears (That’s a good thing!) . The drums were recorded using a set and were not programmed, giving this demo a very old school feel to it. The beats, while relatively simple, keep the tempo and provide backing perfectly. The bass sticks through in some parts of the demo and it can distract from the main guitar riff sometimes, but it is not so overbearing that you can’t concentrate on anything else. The guitar lines are the perfect balance between tremolo-picked melodies and atmosphere-building chords, giving it a nice balance and not overdoing either side of the music. Vocal duties, along with most instrumental duties, were handled by Panzerfaust, the main man behind Forlor. His shrieks and screams sound like the devil child of Bathory and Burzum, sounding very raw but adding a lot to the atmosphere of the music. While the lyrics cannot be easily understood, the music paints a nice picture for you and you can create a story by just using the melodies. Based off of their first bit of material, I think Forlor has a very good future in store for them. Their unique sound is easily recognizable but it still has the ability to please the first wave black metal fans.